Late in the APEX 18.1 release a popup widget was created. 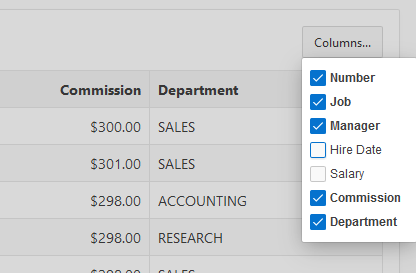 It was needed because of the Column Toggle Report region that was ported from jQuery Mobile to work with jQuery UI and the desktop user interface. Here is a picture of what the column toggle popup looks like. You can put anything in a popup. In this case it contains a set of checkboxes. JQuery Mobile has a popup widget but there isn’t one in jQuery UI. The simplest way to create such a widget is to extend the jQuery UI dialog widget, which is what I did. The APEX popup widget is very small and simple. Currently it is only used by the Column Toggle Report region but I think in the future we will use it for more things. I used it in an app that I showed at the AEPX World conference last month. In a previous article about IG Cookbook I described a Custom Popup plug-in where I approximate a popup using an inline dialog region. In the future I plan to rework that plug-in and cookbook example using this new popup functionality. I hope that a future release of APEX will include an Inline Popup region. Until then here is how to add your own. This assumes you are using Universal Theme. You will have to adjust the details if you are using some other theme. Make a copy of the Inline Dialog template. Go to Shared Components > Templates and find the Inline Dialog template. Enter “Inline Popup” for the name. For the Identifier add a prefix (with your company name or initials for example) to the default to reduce the chance of a future conflict. For example MY_INLINE_POPUP. Open the Inline Popup template you just created. Add a new Template option to group Dialog Size named “None” with CSS Classes js-dialog-nosize (just because it can’t be blank). This option causes no height or width to be set. This is because it is common for a popup to only be as big as its content. Add a Static Content region to the Inline Dialog page position. Change the template to Inline Popup. Open the template options and choose size small. Now you just need a way to open the popup. This is easy to do. 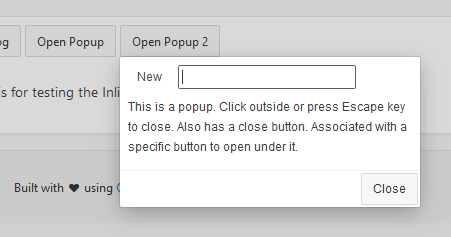 One common way to open a popup is in response to the user pressing a button. Add a button to the page somewhere. Add a dynamic action to the button for the click event. Under Affected Elements set the type to Region and choose the popup region you previously created. Now run the page and click the button. It should look something like this. Note that the above open code uses popup("open") rather than dialog("open"). To close the popup you would use popup("close"). If you are going to listen to any events such as open or resize remember to use popupopen and not dialogopen. Remember to set the affected elements to the inline popup region. If you don’t want to use this.affectedElements you could give the inline popup region a Static ID such as “myPopup” and then change the code to $("#myPopup").popup("close");. To make the popup no bigger than needed set the Dialog Size template option to “None”. Depending on what you put in the popup you may have to use custom CSS rules to adjust the padding or heights of things to avoid scroll bars. The popup dialogs have class ui-dialog--popup to allow targeting them specifically. For example I think there is too much padding around buttons for a popup so I added this rule. Here is a slightly more interesting looking popup. It has a Close button and is positioned under the button. Inline popup or dialog regions are easy to create, open, and close but doing interesting things with them can get complicated. If the popup or dialog will be used to enter or edit data use copy in, copy out. Just before or on open copy data from the main page or fetch data from the server. When the “OK” button is pressed copy data back to the main page and/or save to the sever. Think of the dialog or popup like a function that the main page passes data into and on close it returns its results to the caller. The dialog should not know about the main page. Passing data in and out of dialog pages is not without its own challenges but modal dialog pages tend to be simpler. 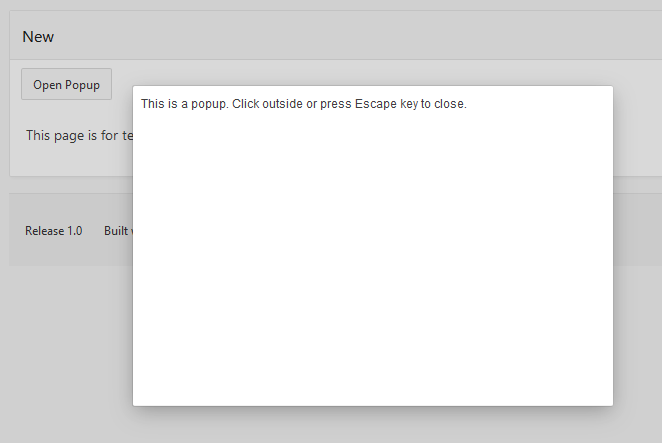 The big advantage of inline dialogs and popups is that they open up much quicker. They are much lighter weight because they don’t open another APEX page in an iframe. Give them a try. Cheers John, can’t wait to give this a go, II can already think of a number of uses. In 18.1 I have noticed a possible bug with inline dialogs, whereby they don’t seem to touch scroll when rendered to a mobile size screen. ?